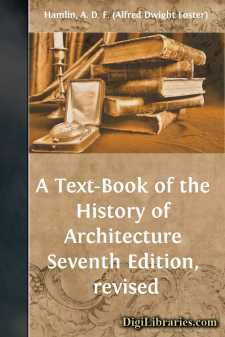 The aim of this work has been to sketch the various periods and styles of architecture with the broadest possible strokes, and to mention, with such brief characterization as seemed permissible or necessary, the most important works of each period or style. Extreme condensation in presenting the leading facts of architectural history has been necessary, and much that would rightly claim place in a larger work has been omitted here. The danger was felt to be rather in the direction of too much detail than of too little. While the book is intended primarily to meet the special requirements of the college student, those of the general reader have not been lost sight of. The majority of the technical terms used are defined or explained in the context, and the small remainder in a glossary at the end of the work. Extended criticism and minute description were out of the question, and discussion of controverted points has been in consequence as far as possible avoided. The illustrations have been carefully prepared with a view to elucidating the text, rather than for pictorial effect. With the exception of some fifteen cuts reproduced from Lübke’s Geschichte der Architektur (by kind permission of Messrs. Seemann, of Leipzig), the illustrations are almost all entirely new. A large number are from original drawings made by myself, or under my direction, and the remainder are, with a few exceptions, half-tone reproductions prepared specially for this work from photographs in my possession. Acknowledgments are due to Messrs. H. W. Buemming, H. D. Bultman, and A. E. Weidinger for valued assistance in preparing original drawings; and to Professor W. R. Ware, to Professor W. H. Thomson, M.D., and to the Editor of the Series for much helpful criticism and suggestion. It is hoped that the lists of monuments appended to the history of each period down to the present century may prove useful for reference, both to the student and the general reader, as a supplement to the body of the text. Columbia College, New York,January 20, 1896. The author desires to express his further acknowledgments to the friends who have at various times since the first appearance of this book called his attention to errors in the text or illustrations, and to recent advances in the art or in its archæology deserving of mention in subsequent editions. As far as possible these suggestions have been incorporated in the various revisions and reprints which have appeared since the first publication. Agincourt, History of Art by its Monuments; London.